I enjoy getting away for a weekend of camping; it’s always nice to head somewhere peaceful and scenic. If it involves mountain biking too, then all the better. But if there’s one thing that really detracts from the weekend camping experience, it’s packing and preparing. With the family in tow, car packing evolves into a task of epic proportions. Loading up can take the best part of a day and there’s certainly no room to have the bikes inside the car. As a result, some form of bike carrier is a must and I’ve had a few over the years. While there’s no shortage of bike carrying options, most tend to suffer if the trip takes you down the roads less travelled. 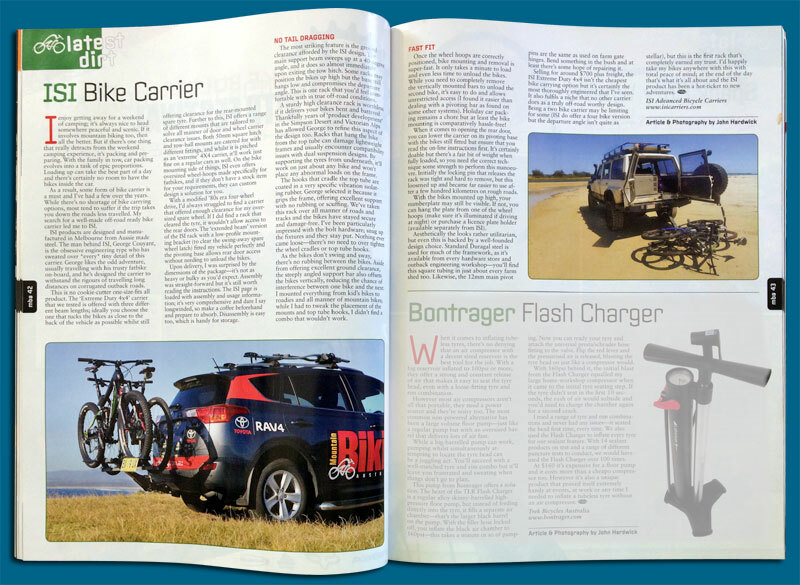 My search for a well-made off-road ready bike carrier led me to ISI. ISI products are designed and manufactured in Melbourne from Aussie made steel. The man behind ISI, George Couyant is the obsessive engineering type who has sweated over *every* tiny detail of this carrier. 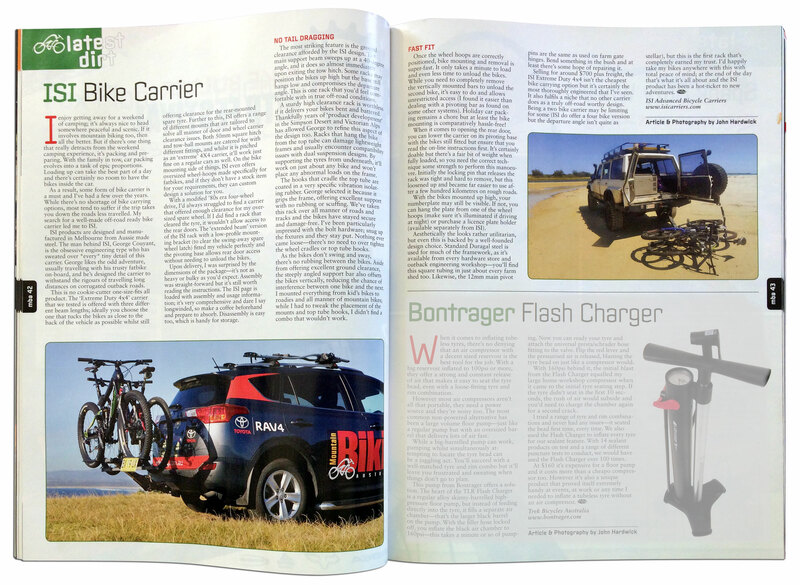 George likes the odd adventure, usually travelling with his trusty fatbike on-board, and he’s designed the carrier to withstand the rigours of travelling long distances on corrugated outback roads. This is no cookie-cutter one-size-fits all product. 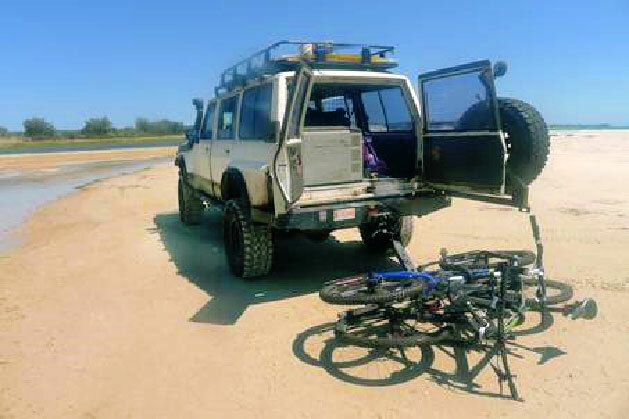 The ‘Extreme Duty 4x4’ carrier that we tested is offered with three different beam lengths; ideally you choose the one that tucks the bikes as close to the back of the vehicle as possible whilst still offering clearance for the rear-mounted spare tyre. Further to this, ISI offers a range of different mounts that are tailored to solve all manner of door and wheel carrier clearance issues. Both 50mm square hitch and tow-ball mounts are catered for with different fittings, and whilst it is pitched as an ‘extreme’ 4X4 carrier, it’ll work just fine on a regular cars as well. On the bike mounting side of things, ISI even offers oversized wheel-hoops made specifically for fatbikes, and if they don’t have a stock item for your requirements, they can custom design a solution for you. With a modified 80s era four wheel drive, I’d always struggled to find a carrier that offered enough clearance for my oversized spare wheel. If I did find a rack that cleared the tyre, it wouldn’t allow access to the rear doors. The ‘extended beam’ version of the ISI rack with a low-profile mounting bracket (to clear the swing-away spare wheel latch) fitted my vehicle perfectly and the pivoting base allows rear door access without needing to unload the bikes. Upon delivery, I was surprised by the dimensions of the packageit’s not as heavy or bulky as you’d expect. Assembly was straight forward but it’s still worth reading the instructions. The ISI page is loaded with assembly and usage information; it’s very comprehensive and dare I say longwinded, so make a coffee beforehand and prepare to absorb. Disassembly is easy too, which is handy for storage. The most striking feature is the ground clearance afforded by the ISI design. The main support beam sweeps up at a 40-degree angle, and it does so almost immediately upon exiting the tow hitch. Some racks may position the bikes up high but the base still hangs low and compromises the departure angle. 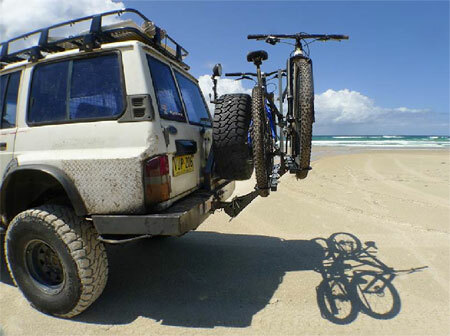 This is one rack that you’d feel comfortable with in true off-road conditions. A sturdy high clearance rack is worthless if it delivers your bikes bent and battered. Thankfully years of ‘product development’ in the Simpson Desert and Victorian Alps has allowed George to refine this aspect of the design too. Racks that hang the bike from the top tube can damage lightweight frames and usually encounter compatibility issues with dual suspension designs. By supporting the tyres from underneath, it’ll work on just about any bike and won’t place any abnormal loads on the frame. The hooks that cradle the top tube are coated in a very specific vibration isolating rubber. George selected it because it grips the frame, offering excellent support with no rubbing or scuffing. 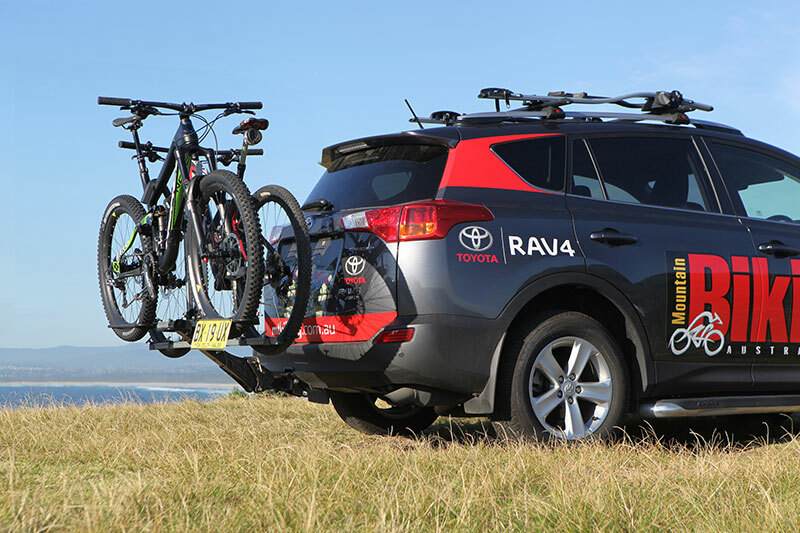 We’ve taken this rack over all manner of roads and tracks and the bikes have stayed secure and damage-free. I’ve been particularly impressed with the bolt hardware; snug up the fixtures and they stay put. Nothing ever came loosethere’s no need to over tighten the wheel cradles or top tube hooks. As the bikes don’t swing and sway, there’s no rubbing between the bikes. Aside from offering excellent ground clearance, the steeply angled support bar also offsets the bikes vertically, reducing the chance of interference between one bike and the next. I mounted everything from kid’s bikes to roadies and all manner of mountain bikes; while I had to tweak the placement of the mounts and top tube hooks, I didn’t find a combo that wouldn’t work. Once the wheel hoops are correctly positioned, bike mounting and removal is super-fast. It only takes a minute to load and even less time to unload the bikes. While you need to completely remove the vertically mounted bars to unload the second bike, it’s easy to do and allows unrestricted access (I found it easier than dealing with a pivoting bar as found on some other systems). Holiday car packing remains a chore but at least the bike mounting is comparatively hassle-free! When it comes to opening the rear door, you can lower the carrier on its pivoting base with the bikes still fitted but ensure that you read the on-line instructions first. It’s certainly doable but there’s a fair bit of weight when fully loaded, so you need the correct technique some strength to perform this manoeuvre. Initially the locking pin that releases the rack was tight and hard to remove, but this loosened up and became far easier to use after a few hundred kilometres on rough roads. With the bikes mounted up high, your numberplate may still be visible. If not, you can hang the plate from one of the wheel hoops (make sure it’s illuminated if driving at night) or purchase a licence plate holder (available separately from ISI). Aesthetically the looks rather utilitarian, but even this is backed by a well-founded design choice. Standard Duragal steel is used for much of the framework, as it’s available from every hardware store and outback engineering workshopyou’ll find this square tubing in just about every farm shed too. Likewise, the 12mm main pivot pins are the same as used on farm gate hinges. Bend something in the bush and at least there’s some hope of repairing it. Selling for around $700 plus freight, the ISI Extreme Duty 4x4 isn’t the cheapest bike carrying option but it’s certainly the most thoroughly engineered that I’ve seen. It also fulfils a niche that no other carrier does as a truly off-road worthy design. Being a two bike carrier may be limiting for some (ISI do offer a four bike version but the departure angle isn’t quite as stellar), but this is the first rack that’s completely earned my trust. 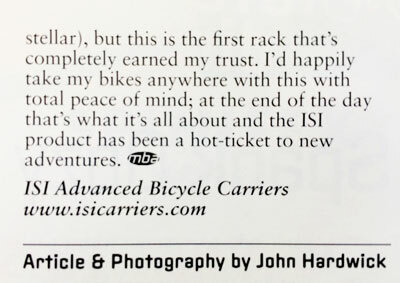 I’d happily take my bikes anywhere with this with total peace of mind; at the end of the day that’s what it’s all about and the ISI product has been a hot-ticket to new adventures.